In the mid-19th Century, London was spreading from the central areas to the north-west, and the Chalcot Estate, part of the endowment bestowed on Eton College by King Henry VI, was undergoing development. Local records note that by 1848, part of Provost Road and Eton Villas had been filled by speculative builders with ‘highly delightful detached and semi-detached villas’. 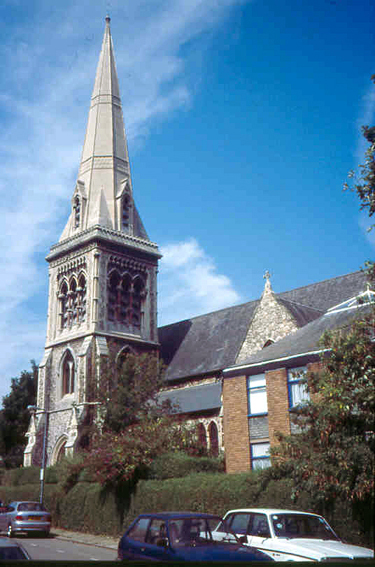 However, it was thought that the absence of a church was ‘to the disadvantage of the neighbourhood by keeping families away, who would otherwise be disposed to reside here’. In 1846 Eton College offered a site on a triangle of free land bordered by Provost Road, Eton Villas and Eton Road. In the following year a group of local interested parties agreed that a church should be built on it and dedicated to St. Saviour. In 1848, a temporary structure was erected on a site close by, which was used for worship until the present building was completed and consecrated eight years later in 1856. The architect was Edward M. Barry (son of the more famous Sir Charles Barry). His design was for a building constructed of Kentish ragstone in the Early English style. At first it was without a spire, but this was added – when funds permitted in 1864. The decoration of churches is often a difficult matter, especially in terms of the technical requirements. I was asked to provide advice on the decoration of this north London church.